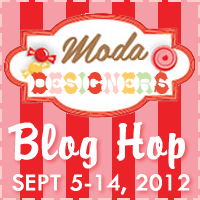 Welcome to our site on the "Oh so Sweet" Moda Blog Hop! We are celebrating National Sewing Month. The vegetable garden began with this plastic raised bed we found at Sam's outlet. I planted several varieties oregano and thyme and turnips. I have never really planted many vegetables...just the typical tomatoes and peppers. So this was a real learning experience for me. 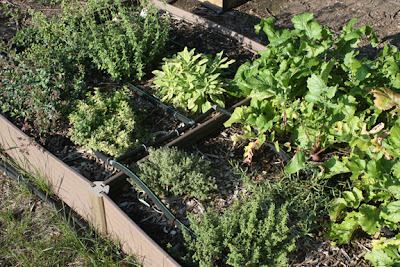 There was a secondary reason for planting the different varieties of oregano and thyme. I'm always thinking of nectar sources for our honeybees. 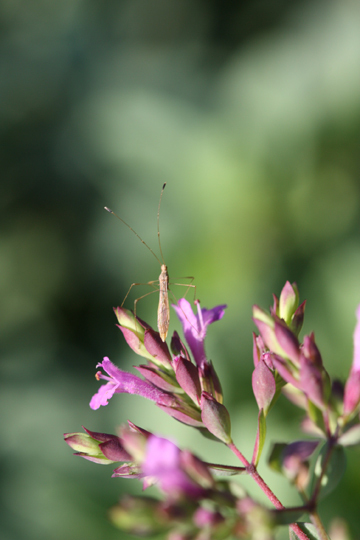 This morning I found a baby praying mantis surveying the world. Actually our summer was so hot and dry I hadn't seen many insects pollinating anything in our garden until recently. We've had to feed our honeybees sugar water for most of this summer. We go through about 60 - 80 pounds of sugar each week. 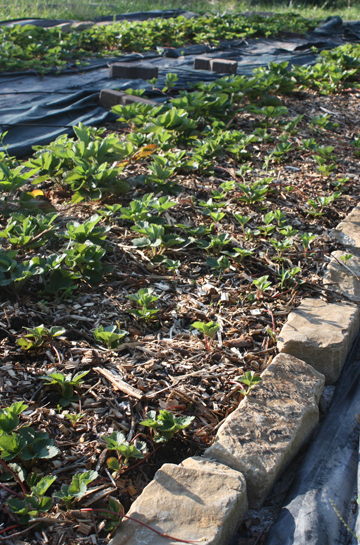 I ordered and planted 70 strawberry plants in the spring. They've been sending runners out, expanding the bed to at least 300 plants. As much as I've had to care for these babies I better get at least a million strawberries next summer. Well.....at least enough for a jar of jelly. I've learned quite a bit this summer. I've learned how delicious sweet potato leaves must be. 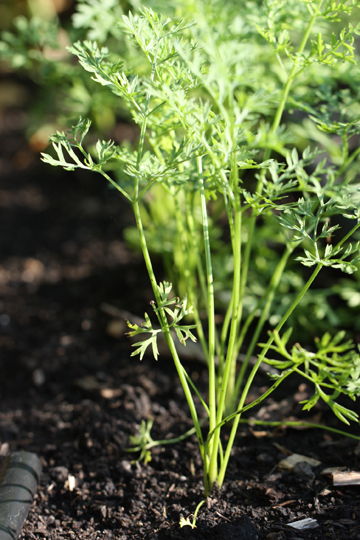 I've observed the great beauty of carrot leaves in the sunlight. I've seen how bean seedlings leap from the ground in their great fury to grow. I've discovered I break out with a "hello sweetheart" when I see new seedlings. To celebrate National Sewing Month we have a project for you. Click on the link for the pattern. I love my Message Board. It's the perfect place for my earring collection. I can now locate each pair easily and I no longer find them in a tangled mess. Be sure to visit the designers listed below tomorrow. Look for a visit to some local community gardens here in K.C. and a contest soon! Thanks for the cute message board pattern and the good idea. I need a place to storage my necklaces so they don't end up in a knot - something like this would work well! I think I may just rey this..I am not a quilter, but I think I can manage this. Thank you. Thanks for the message board project. I think I will make it into a small quilt instead. Love your pergilla. I live in Ia too and just can't seem to make it to Walnut's antique fair. Your morning friend is perfect for your garden. I wouldn't have been able to pass it by either. I can tell you put a lot of work into your garden. It's funny, I always figured you must plant veggies all the time. I think of you as an expert at absolutely everything. Love the columns you purchased. And love the message board too. So pretty! I'll have to see if I can make one for myself someday. I love your garden! We have been so hot/dry this summer that ours dried up almost before we started. We did harvest several gallons of crooked neck squash! I look at the late summer magazines filled with recipes for salsa, etc with great longing! Your photos of your plants are amazing. What a great idea. I love the fabric, as well. What a GREAT idea. I can't wait to make me a message board. Thnak You for the pattern!!! Love the project and the garden both - hope you get to host your dinner parties soon! I love your garden! It seems peaceful and plentiful. I can imagine enjoying a beautiful dinner or bar-b-que there. I live in a very small, rural town in Central Utah. AXTELL! Only about 250 people live here. My home is surrounded by alfalfa and corn fields. My nearest neighbor is a block away. I love your fabric and pattern designs. Your fabric speaks peace to my soul! What a beautiful garden you have. I love the pillars! Foram muitos quilos de açúcar,eu adoro abelhas. I loved your garden tour. I like using raised beds to contain it. It looks so much neater and seems easier to weed. What lucky bees! They are like little fuzzy pets! Great project. My Granddaughter could use one of those soon to keep her jewelry on so she'll get into the habit of putting things away. Thank you. Beautiful fabric you've used on the project. Thank you so much for the project idea. This is just what I need to clean up my earring mess. I enjoyed touring your garden, we are working to add more to our garden each year. I love the pillars and what you are doing with them. Love your earrings & the cute message board. Thanks! what a great idea. thanks for free project. I can never find "a pair" of matching earrings. Wow I love your garden and while it was very hot overthere, here it was wet, wet, wet! But now we are having in Indian Summer and are enjoying it to the full! I love your message board - although I might just frame it and enjoy looking at it since it's so lovely! I have a ton of antique frames just sitting in the basement begging to be filled with something unique! Love that you blogged about your gardens - with the drought it was a challenge this year but looks like you did well! Beautiful earrings and thanks for the project idea. I loved the tour of your garden. I also decided to grow some herbs this summer in container pots. They have thrived very well, much to my surprise! Thanks for sharing. What a beautiful garden in the making. Love the pillars. Thanks for the cute project. Love the message board! It is just what I need for my jewelry. Cute idea. I'll show this to our BBD group tonight. Saw Cinnamon Spice the other day...some beautiful designs. Good luck in the backyard! Yikes. OK you're excused for not posting for two months. What a creative way to make a message/jewelry board. Thanks for the great idea! aww what a sweet idea..thank you for sharing..
your garden is so cute too. You have been very busy indeed. Still, there is nothing like a homemade garden. Thank you for the message board pattern. It is a very clever idea. Something you can make and then have it ready for Christmas. The message board is a great idea, I need a new one and this is so much prettier than what I currently have. Thanks. Gorgeous garden. I enjoyed all your photos. I am going to give the message board a go. Love the message board made with the Cinnamon Spice fabric. What a lovely garden! I can just imagine what the deer that hang on in my flower garden would think! I love the message board and will use it for earrings, that's a great idea. No more searching for the right pair. Thanks, Margaret Hot here in Mineola, TX too. Good luck w/ your strawberries; just watch out for the neighborhood cats which destroyed my plants. My husband is jealous bec. you have bee hives. He read your blog when you were constructing them. FYI Have your "stockings" hung for Halloween along w/ your other cute cross stitch Halloween projects. 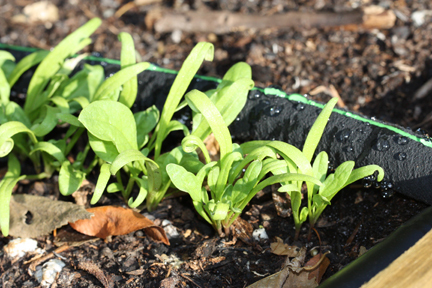 gardening can be a hit and miss kind of thing. looks like you had some good things growing. I think I need a message board now for my jewelry! Thanks for the pattern. Love the message board, Alma! I think it'll make a great "To-Do" board in my sewing area! Love the pattern. Thank you every so much! Love to be oranized. Loved hour gardening tour, it really is a labor of love! I love your project! I have a similar frame in my sewing room for pinning inspiration bits and buttons and knickknacks....love it! Great idea the message board. I really like the arbor for the yard...yes, I could see having a party out there. Beautiful garden, and lovely idea for the message board. Thank you for sharing. The earrings in the last photo a very pretty too. Did you make those as well? I love the garden! Your garden is just beautiful! I can't believe how many strawberry plants you've got...YUMMY!!! Thanks for the great pattern! 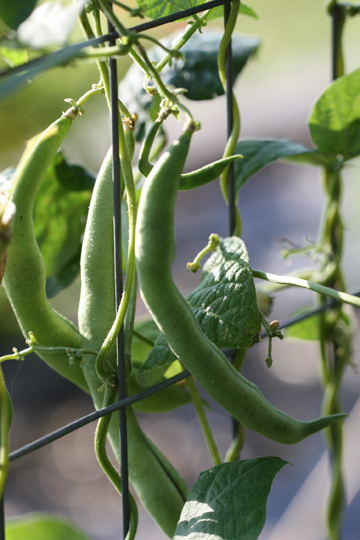 Your garden is very inspiring - I'm glad you were so successful, and even more so during a difficult growing season! I know from experience that your gardening is alot of "work". We had 2 HUGE gardens plus fruit trees so there was alot of weeding, picking, canning and freezing going on. I barely have the energy to pull weeds, I admire your gumption! I support my local CSA and enjoy the fruits of their labors. At the state fair, I saw this sign: If you ate today, thank a farmer! What a great idea to store earings! Love this...thank you!!! Love the message board idea, and the garden inspiration! In the process of moving here,and cant wait to have a garden next year. Love knowing where my food comes from and exactly what is in it! Love the message board pattern!! Thanks for the sweet design! Just love your garden and the sweet project to work on!! Thanks for that darling quilt pattern - it looks just great all framed - and wonderful to be useful too! What a wonderful project. Your raised beds look really good. I know you have enjoyed them. Love the framed message board- what a great idea! And your garden photos are wonderful. I am now inspired by that raised garden bed...hmmm...will my husband make one for me? No more back breaking while weeding. Your project is great, and I hope to make a couple for gifts. The message board is lovely--and so are the earrings. We have to amend our clay soil to grow anything. For that reason, I planted tomatoes in pots instead of the ground. I'm getting ready for the second flush of harvest that happens in the fall. I like to halve them and put them on top of baked macaroni and cheese or on top of cauliflower gratin. Cuts the salty taste of the cheese in both of these dishes. I love your garden and thank you for the pattern! The pattern is very pretty. Thank you for sharing! A great gift for that college girl away from home-- thanks.. Love small projects. Love your message board! Thanks for the pattern have printed it out just now. I love your plans for your garden--and the method of not telling your hubby the plans right away. I do the same, LOL. Thanx for the pattern! Love the combination. great yard! Beautiful project. Thanks for sharing. Thanks for the pattern for the message board. Awesome that you accomplished so much in the heat this summer! Cute pattern. I like that idea for organizing my jewelry! Your garden looks beautiful! Great project!!! From candy to message board. Yes, I can certainly understand why you've been absent, but you were missed never the less. Do we have honey yet?? Thanks for the pictures of the flora and fauna. I am looking forward to the changes autumn will bring to my beds. Thank you for this great project! You are right there is nothing better that eating fresh grown items. Thanks again! Thanks for the pictures of your garden. I do not have a green thumb but am able to keep day lilies alive. I have been looking for something to do with my message board in my sewing room and this pattern is a great idea. Thanks. What a great idea to display your earrings! Thanks. Thanks for the really cute project. Intend on getting one done right away. Love your books and patterns. Thank you for the message board pattern. So adorable. I'm thinking Christmas gift(s). What a great way to use a small quilt, love the message board idea. Thanks for the pattern. I have been wondering about how your bees are doing..thank you for the project pattern! Your garden dining area is going to be beautiful. Thanks for the project. I have all the supplies. I think I'll make one for my granddaughter. Thanks for the project pattern. Love all those fresh veges. I also built a new raised bed am am now canning tomatoes! Love your pictures and the pattern. Thanks for the pattern and pictures of your new space with the columns - I would love to create the outdoor dining "room" also,, so many wonderful ideas. Joyce. Your message board is adorable. What a great idea. I love your garden. I have my first garden this year. I have three raised beds and we just made my fourth one. 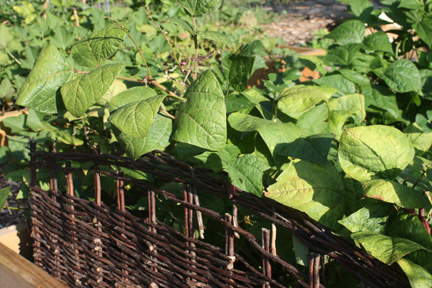 I have pumpkin squash which is taking over my garden area, cucumbers, tomatoes, okra, pole beans, bush beans and green peppers. I just planted carrot, broccoli and golden pear tomato seeds last week and they are now sprouting. I hope you enjoy your garden as much as I am enjoying mine. Thank you for the sweet little design, I like the little doll quilt on it's own! Thank you ahead of time if you are doing a giveaway! Thanks for the cute message board project. It is going to make a great gift for my sons girlfriend. First time to your site, I love it. 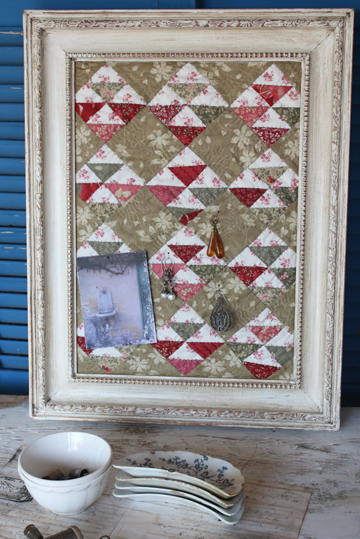 I've made a similar message board using vintage quilt pieces. I use mine for recipes. I like the idea of using it for jewelry, never thought of that. Love the pattern for the message board. It'll be great to have something to use those old windows i've been storing. Great project, and interesting gardening info. I love praying mantis! Thanks. Thank you for an adorable new way to use a quilt! Love the message board project and your lovely garden. We are moving soon and I plan to have raised bed gardens next year. Love the fresh veggies. Thanks. Great garden! I love the columns. And the project what a great idea. Thanks for sharing. I love this little pattern. Gardening is so rewarding and I love the idea of raised beds. Thanks for the cute project! You have a beautiful garden. Your garden is so lush compared to ours. The heat is baking us here in rural Florida. Thanks for the lovely project. Great message board! My daughters birthday is Saturday and I'm hoping I have time to make one! I think she would love it! Love your garden and also your project pattern. The message board pattern is great! Great idea. By the way, I actually know where Walnut, IA is. I was born in Iowa and lived there through college. I will always be an Iowan. I like your raised beds. I have two of the Sam's beds and would like the raised ones you have. I love the message board. I'm going to have to make two - one for my daughter and one for me. Thanks for sharing! Your gardens are truly beautiful. Thanks for the Message Board Pattern. Thanks for the great idea....I love reading about your gardening plans....I love to garden, as well. Thank-you for the quilt message board idea and pattern. I love the fabric you used for yours. 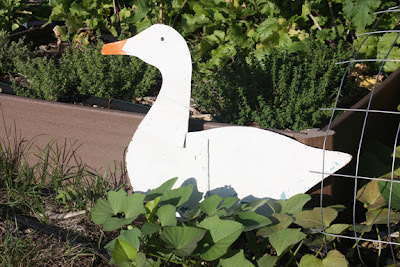 How fun to stroll through your garden, your little duck is very cute. We had a garden this year too, it produced LOADS of zucchini and squash so now I have LOTS of chocolate zucchini bread in my freezer! The messasge board is really cute, I love the idea of hanging your earrings on it. Thanks! I have been to the antique weekend in Walnut, Iowa many times. Haven't gone the last few years because of $$$. We would meet my sister and husband who would drive up from Overland Park, KS. We would have so much fun walking the streets looking at everything. It was always a great weekend. Like your message board. A great idea. Also enjoyed touring through your garden. Raised beds are the best for gardening, aren't they? 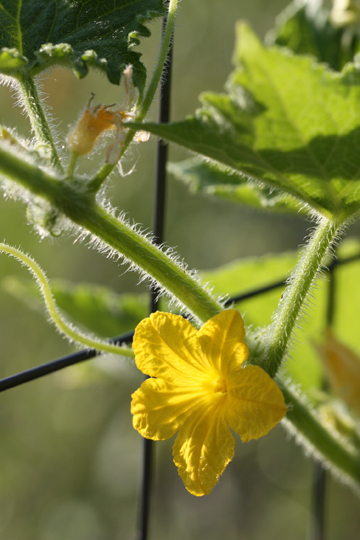 Everyone was amazed at my 3 tomato plants and 2 cuke plants this summer...they have been loaded since early summer. Asked me what I'm doing to them...my response, neglecting them! Seriously, I was, but then read in garden section of local paper that they only need a good watering about 2 times a week. Perfect, more time for quilting! Thank you for the message board pattern! Great stories and pattern. Thank you. The message board is adorable. It would make a cute little quilt, too. Thanks. What a lovely post and what a beautiful garden. Your columns look lovely. Thanks for the pattern. I love your garden and hope to be able to enjoy one again someday. Thanks for the cute pattern and earring idea. Great idea, will make one too! And the pictures from the garden was fun to see. Where I live we've had far too much rain this summer, but we're having some warm days next week. Can't wait!!!! We've heard about your horrid drought and send our hopes for breaking rain. Australia is well familiar with them. The plight of the honey bee is so under reported...glad that you are able to offer them some help. Our bees are enjoying the spring blooms on the native trees and shrubs here. That message board looks so pretty you can't put messages on it, because you wouldn't see it anymore! Jewelry is much better indeed! Your message board is adorable!! My daughter would love it. Beautiful garden, thanks for the bee information. Very interesting. The message board/jewelry hanger is great! That is a really cute idea for keeping track of your earrings! Wow, what a great garden! I wish we didnt have an overpopulation of deer so I could garden. Love your project idea. I will definitely try this -- thanks! Please post pictures of your garden next year too. 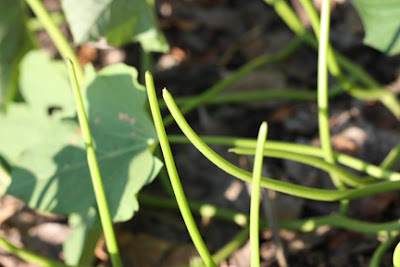 I garden and I love to looking for ideas from other gardeners. Super cute board. Thank you for the pattern. Cute message board. Love it!!! I loved seeing the pictures of your garden! Thank you sharing your message board! It was lovely seeing your garden. I do not have one but I do enjoy the beauty of a garden. Cute earrings! Thank you for another gorgeous project and bless you for feeding your bees. That s a lot of sugar!! It has been horribly hot across the nation so congratulations on keeping a garden going! Your message board is beautiful. What a fun project! Thanks for sharing pictures of your lovely garden. Oh wow, that is a very neat idea!!! I love that message board, and thank you for sharing the pattern! :) My son (he's 6) is quite the botanist/gardener/horticulturalist and would love to see the garden you are growing! I will share the pics. Indeed, gardening is so fun and therapeutic! 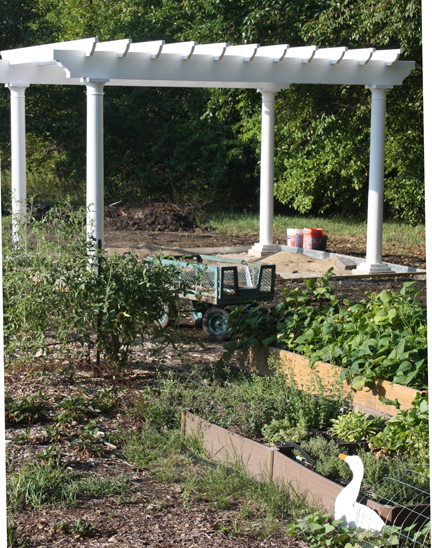 Beautiful garden -- and beautiful project -- thanks for sharing. Brillant idea! Thanks so much for sharing this project with us! I loved seeing your garden and plants. It has been so dry this year that most everything we planted withered and dried. Have a wonderful weekend! What a wonderful, uplifting and beautiful (photos) blog post. It made me smile tonight. Thank your for sharing this! (I love the pattern, too!). Beautiful garden; I understand completely how it keeps you away from your blog...I do the same! Thanks for the pattern. Someone sent me a packet of the little squares, and now I know just what to do with it! Thanks for showing us youe back garden. I love the columns! Very cute message board and a great idea to keep your earrings there. I, too, live in KC....King City, Ca. Love that message board. What a great idea for hanging jewelry! Thanks! Thanks for the "Oh So Sweet" pattern. I love it and enjoyed your garden tour. Very cute project. I just have to say we moved to Kansas 11 months ago from Oregon. I also wanted to say I grew up in Neola, Iowa so I know where Walnut is. Enjoyed your tour. Love the project ideas and garden ideas! Your garden looks great despite your lack of rain! Beautiful Gardens, love the idea. Love the message board idea and the fabric. 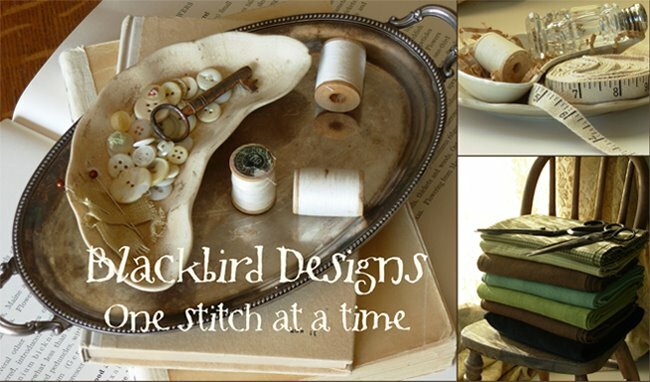 Love your project..both garden and sewing.. thanks for sharing. Love the message board! Thanks. Love this message board, especially using it as an earring holder. It would look great in my closet and make my earrings look even better! Thanks! Wow! What a beautiful garden! Certainly beats the red clay I have. Thanks for sharing! 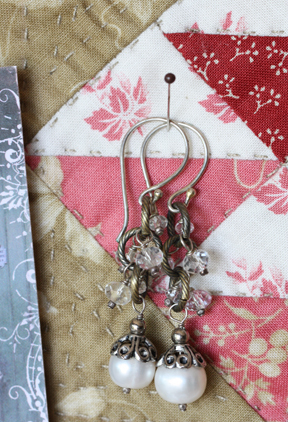 I love the idea for storing earrings in plain sight - so pretty and feminine! Your plans have come to fruition for the most part. Mine still reside in my head. I love your garden. 2I have enjoyed both of you and your work for years and made many of the projects in your books. Thank you! I love the message board idea! So cute! what a great garden you have! I've been to walnut, Iowa for the Father's Day weekend and it's so great! I really need to get back there one of these days. Best sale I've been to so far! Love your message board/earring organizer-you can't have too many of these. It would also work for little girl bows/barrettes/bracelets! Thanks for the idea! I love the message board aka place for your earrings. I have actually been brainstorming how to organize my own earrings. Love your Garden and pattern. Also Like how you can get items on your "Honey do" list done. I simply LOVE your memo board! As soon as I can I am making one for my sewing room! I love your memo board! Not at all like the BORING tan cork ones! I definitely will be making this one for my sewing room and it shall have some RED in it!! What a great idea, thanks for the project. Thank You for sharing the Message board project...I need one in my house. Love the garden pictures! I can just see this made of French General fabric. Thanks for the pattern!